The weather has warmed back up a little here in the Valley of the Sun to exactly the sort of temperatures that make folks pack their bags and come here for the winter, but as long as it's not triple-digit heat, I can still knit up a storm. In fact, that's why I'm writing this post. I've finished another project since the one I told you about last week, and I've almost completed another. I also took advantage of online Black Friday sales and bought a big box of yarn. I've got all these ideas for things to knit. I've got all the yarn. I usually say that I'd love to have a few more sets of eyeballs so I could read more than one book at a time. Now I'm thinking that I need the hands to go with those eyeballs so I can have several pairs of knitting needles going at the same time. Yikes, I'm a self-created monster! I've been working some complicated lace patterns lately, and I wanted something a bit... mindless... to do. I loved the look of this cowl, which is a combination of simple knit and purl stitches, and I had the perfect yarn, so here it is! 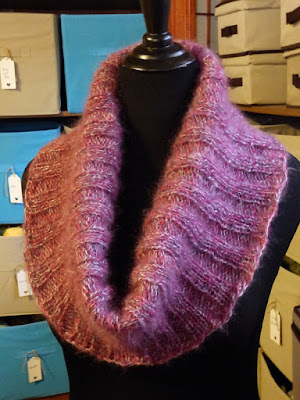 The pattern is called "3 Rib Cowl," and the yarn I used is Rowan's Kidsilk Haze Trio (now discontinued) in a color called "Hawthorne" (a mix of red, white, and black), which is 70% mohair and 30% silk. If you're a knitter and like the look of this cowl, follow the link I included to the pattern. You'll be able to see it worn in several different ways, and you'll also see a yarn substitution link. This yarn is as light and soft as a cloud and drapes beautifully. (Cozy and warm, too!) I'm also very pleased with it because I found the solution to a common problem when something is knitted "in the round" (all one piece, seamless). There can be a gap right where the last stitch is joined to the first, but thanks to wandering around the interwebz, I now know what to do. The only problem I have now is trying to decide to whom I'll gift it! Now... what was I watching on television while knitting this beauty? Something that's been around for over a decade: NCIS. IMDb gives this rather terse synopsis: "The cases of the Naval Criminal Investigative Service's Washington DC Major Case Response Team, led by Special Agent Leroy Jethro Gibbs." Have I been a fan from the very first episode? Well...technically, yes. I found it on Netflix after its eighth season. Denis and I liked it from the very first episode and went through those eight seasons like a four-alarm fire until we were up-to-date and watching new episodes on a weekly basis. 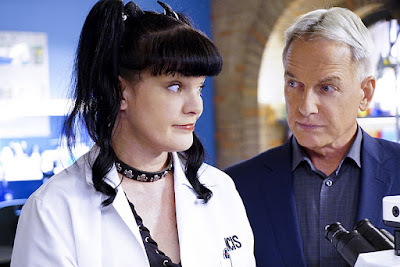 For my money, NCIS is one of the best crime dramas on television. Yes, the stories are that good but do you want to know what turned Denis and me into diehard fans? The cast. The ensemble cast is superb and truly feels like a family. They've had to endure some actors leaving over the years, but they've survived because they've kept that family dynamic intact. The writers know their stuff when it comes to characterization. Each person has his/her own history that we learn over the course of the seasons. Each person has also been the major focus of episodes. The only bad thing I have to say about this television series is that I can't concentrate on my lace patterns while I watch. I'm almost guaranteed to drop a stitch. If you haven't watched it, I hope you'll give it a try-- especially if you can watch it from the very beginning. 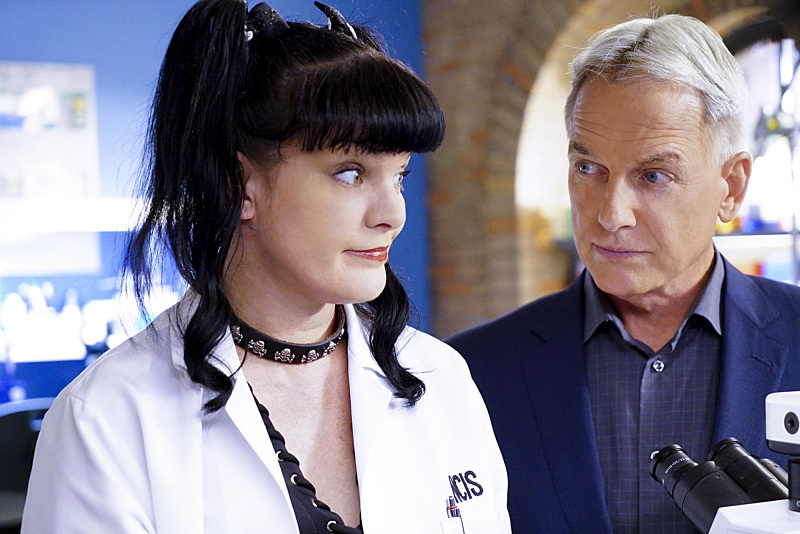 NCIS really is a well-written show, isn't it, Cathy? I enjoy it very much, too. And that cowl is gorgeous! It looks nice and warm, too. NCIS is a favorite in our house too. The original is our agreed upon fav, but I like the New Orleans edition too. Your knitting is superb. Great job! Yes, Denis and I like NCIS: New Orleans, too.